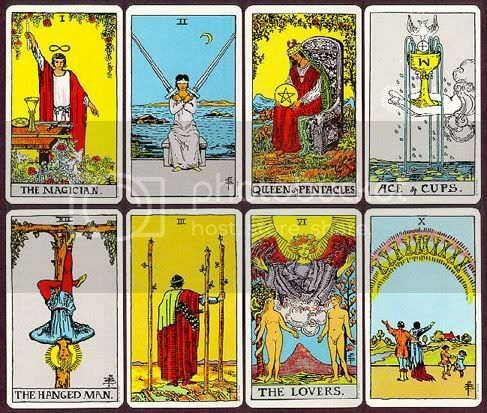 The course is designed for the concurrent use of two decks: the traditional Rider-Waite one and a lovely new deck called the Tarot of the New Vision. They work beautifully in conjunction with each other to give an additional dimension to the pictures you can see. 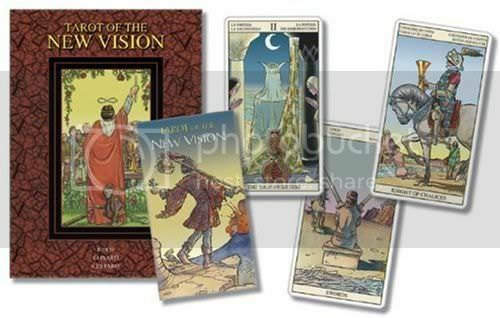 The Tarot of the New Vision is drawn from the point of view of what is behind the figures on the original Rider-Waite illustrations. To me this gives a 'solid' 3D reality to the little worlds of insight and psychic perception which the cards can open for us. There are all sorts of rules about Tarot cards and how to handle them, where to put them when they aren't in use and how to cleanse them. As with anything in the psychic and spiritual arenas the important thing is that you do what is right for you. If it feels as though the cards are calling to you to put them under your pillow and sleep in (on? LOL)them, then do that! Wrap them in Japanese silk embroidered with cherry blossoms and storks or enfold them in homespun cheesecloth made into a neat little parcel and tied with a piece of purple leather if you want to. The same goes for cleansing": you can put a crystal with them, smudge them with sage or sprinkle them with sea light (!) salt(?). Leave them out under a full moon with a couple of crystals or shine divine light on them. DON'T LET ANYONE ELSE TOUCH THEM. All right..... I am ready to learn basics of tarots. I most likely am not a practitioner of cards but want to know more about the symbolics. Learning about the traditional symbolism and deciding on our own interpretation is an important part of the course. No i do not but I know most of the cards, I have them mentally. I know some of the alchemical history of the cards and need to fill in some of the blanks mentally. I didn't open mine immediately either. It's totally up to you where you put them and what you do with them. (See my first post). Mine are sitting in an empty perfume box (!) on my desk behind my computer.